Swami Paramananda, the descended soul and our beloved Guruji started this Mission as a spiritual organization based on the philosophy of Thakur Sri RamKrishna and Swami Vivekananda i.e. to render services especially to economically downtrodden people irrespective to caste, creed, or religion. While travelling throughout India, he felt his heart ached for the oppressed masses of India who suffered poverty, especially the young children who do not have any parents to take care of them. Thus, he felt to build this mission to provide a service to the destitute orphans and ill-fated oppressed masses. This Mission was established in 1978 on the day of Kojagori Lakshmi Puja in autumn. While this mission began in a very small plot of land donated by a noble hearted man of Banagram to erect only a tiny hut, gradually donations flowed in. 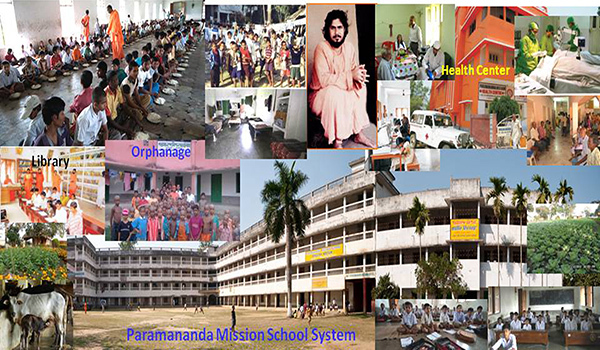 With a divine connection and Guruji's love and compassion, a handful of young man and woman joined hands in building the Paramananda Mission, which presently covers a vast area of land with paddy fields surrounding it. Amazingly the mission became grown by leaps and bounds. People will find peace and solace in the hermitage of Swami Paramananda. The Mission centers an open space, surrounded by several ponds with tall Debdaru trees, beautiful plants, and colourful flowers that add a charm to this scenic beauty. Swami Paramananda loved nature. With his instruction a cool and calm atmosphere had been created which is free from any kind of pollution. Now, the melody of the wind rattling on the leaves, chirping of the birds blended with the tune of cuckoos, is not only admirable but will make you realize the essence of love and enjoy the ever-flowing divine blessings of Guruji. Education to the destitute orphans is the main service. The Mission now has an Elementary School and a High School that serves the basic education from the Nursery, Kindergarten, and to 10th grade. The Mission also has various other academic programs such as the Sanskrit Academy Centre, the Youth Computer Training Centre, Music and Folk Song Schools, Driving Training School, and various Vocational Trainings. A new hostel for the Orphans has been constructed which accommodates 350 orphans. Plans were also created to extend the hostel to accommodate 700 orphans. Apart from the orphans there are around 125 monks and Brahmacharis and a regular visitors & devotees adding up to about 500 on an average day. This Mission also provides health and education services which are free of cost to the surrounding community with a radius of about twenty miles. A new project has been started to make a home for the seniors to allow them to maintain their sense of independence and dignity which they would otherwise be lost. We now have an increasing financial need for these services to the children of the orphanage and the children who attend from the local community along with the medical services to the community. We need help to continue these essential services that are important aids in the peace-building process, as we move, one step at a time, towards a world of lasting peace, to our ultimate destination. Peace - Peace. Stay informed. stay involved. Start here. Dear Atman; Life is the living idol of God. Know Him, love Him and serve Him. Know Him with your head, love Him with your heart and serve Him with your body. Life is a journey – a journey of love towards fulfillment. Love will take you Onwards, Onwards and Onwards towards the Self-Realization. Be Sincere – Be Beautiful – Be a Devine Lover. You will see that there is Bliss. God has infinite compassion. Om Shanti - Om Shanti - Om Shanti.